Sure, Christmas is a holiday that brings the joy out of everyone. If I’m being completely honest, though, it’s one of the most stressful times of the year for me. The dinner parties, excessive time spent in the kitchen preparing meals, the last-minute shopping, and the crowds sometimes just completely drain me from what’s supposed to be a magical time for the family. Instead of saying RSVPing yes to every. single. engagement., I’m taking a time out this year and planning a couple family-only game nights where we’ll play holiday games and just sit around and chill. Hopefully these holiday games will help us relax and truly enjoy the season. 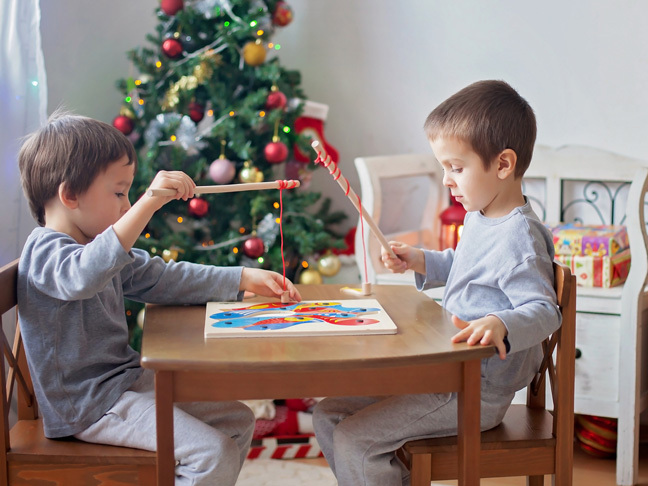 I’ve been researching obsessively, and came up with these entertaining, holiday games are great for kids. Bonus: you and your spouse will love ’em just as much as the kids do. Divide your guests up into teams. Give each team a roll of green crepe paper, a variety of ornaments on hooks, and tinsel. Have the teams choose one member who will become the Christmas tree. Then, set a timeer for two minutes. The team has until the buzzer goes off to wrap up their Christmas tree with the green streamers and decorate them with ornaments and tinsel. Once time is up, the groups will vote on which tree is the best (or most creative, or prettiest). This one will get everyone dancing! For this game you will need two empty tissue boxes (one per team), two ropes or ribbons, and 10 to 20 small jingle bells. Poke two holes on opposite ends of the bottom of the tissue boxes and weave the rope or ribbon through them, then tie the empty tissue boxes around the players backside. Place 10 little jingle bells in the box. When the Christmas music starts, one player per team has one minute to dance out as many of the bells from the box that they can. This game is great for the kids, and parents will enjoy watching their excitement rise as they get closer and closer to the final prize. Tie a prize at the end of a ball of yarn (provide one piece of yarn per child) and spread the yarn out throughout the house. Let the kids follow the ‘maze’ to get to the prize. This could also be a great Christmas morning game for opening an extra special present. Purchase enough Santa hats for all of the children at your party. Before they arrive, pin the name of a holiday character to the top of each one. Put a hat on each child’s head—without letting them see the name on the hat. Have the children move throughout the room, talking to one another, and asking ‘yes’ or ‘no’ questions to try to guess their identity. The first person to guess who he or she is wins the game. Divide players into teams, or if multiple families are present, each family can make up a team. Provide each team with a pair of pantyhose with the toes cut off, two pieces of ribbon, and at least 10 balloons. The goal of the game is to blow up the balloons and stuff them into the pantyhose (5 per leg), then tie the toes closed using the ribbon. Once they have completed this, one team member must wear the pantyhose on their head. The first one who dons the completed antlers on their head wins. Fill a stocking with a bunch of simple mystery items (e.g. toy cars, chalk, stuffed animals, marbles, etc. ), then pass the stocking around the circle, letting each child guess what is inside. They can shake the stocking, smell it, or simply feel the shape of what is inside. Write down their guesses, and after each child has made their guess open the stocking and see how many they guessed correctly. Divide the children (or families) into two teams. Gather a collection of items (like pictures from the internet, cards, items from the house, etc.) to represent the items named in the “Twelve Days of Christmas” song for each team. Ensure that the kids all understand which lyric matches each item, labelling them, if necessary. Give each team an empty basket or stocking, then place two buckets with the items at the other end of the room. When the race begins, the first team member must run to the buckets, grab the first item named in the song, and return it to their bucket or stocking. The second member then runs to the buckets and grabs the second item named in the song, and so on. The winning team is the first to collect all twelve items inside their bucket or stocking. For this minute-to-win-it game you will need cookies, either homemade or store-bought (round ones work best!). Divide the children into two teams. Give each child a cookie which they must place on their foreheads. Instruct the children that they must move the cookie down their face and into their mouth, without touching it with their hands. If the cookie falls, they need to pick it up and star over (you may want them to do this on a clean drop cloth so it’s not so weird when they keep dropping cookies on the floor and eventually eating them). The team that wins is the one whose participants have all eaten their cookies. Place a pile of candy canes on a table and provide a plate or small basket for each player. Give each player a candy cane to put in his mouth with the hook end down. The player must use the candy cane hook to pick up as many candy canes from the table as they can in one minute and move them to their plate or basket. When the minute is up, the player with the most candy canes in their basket wins. Repeat with two new players, one per team. Divide the children into two teams and place a dividing line in the middle of the room. Provide each team with a basket of crumpled white paper or tissue paper. Once you call “go,” the players on each team must grab a snowball and throw it into the other team’s side. They may pick up any thrown snowballs on their side and throw it back to the other team’s side. This continues for one minute. The team who has the least number of snowballs on their side after one minute is the winner. For each team, provide a wreath, a bag of marshmallows, and a bucket. Have one person from each team hold the wreath to their side, and place the bucket directly behind the wreath. Another team player will have one minute to throw marshmallows, one by one, through the wreath, aiming for them to land in the bucket. After one minute the player with the most marshmallows in the bucket gets a point for their team. Play again with two other team members, and so on. The team with the most points after each player has had a turn wins the game.